I’m on a quest to make a DIY air purifier. Step one was my research into how different filters work. Based on that, I concluded that a HEPA filter is all you really need to make an effective air purifier and fight particulate air pollution somewhere like China or India. Given the fact fancy air purifiers run for 8,000 RMB in Beijing, or 100,000 INR in Delhi and most people don’t have that kind of money, I thought I’d try making my own DIY air purifier. Wait, Does the DIY Purifier Actually Work? I give data on how well this DIY air purifier works here (1, 2, 3, 4), but here I’ll explain how I made it. It’s important that it has a flat front or back so that you can strap the HEPA filter to it. Since then, I tested HEPAs from all the manufacturers I could find to see if I could make an even more effective DIY air filter, and found one that captures more particles and has better air flow. Because I buy it in bulk and ship it through the shop for my social enterprise, it costs less (75 RMB) than that first HEPA I bought. I’ve tested this HEPA filter with my particle counter, so I know it works (watch live DIY filter test here). This is where the DIY fun starts! It helps if you have pliers for this. Then turn the power setting to 3 and pull the knob off – we’ll be using this DIY air purifier on the highest setting. The knob gets in the way of the HEPA. Without the knob, I turn my DIY air purifier on and off by plugging and unplugging it. 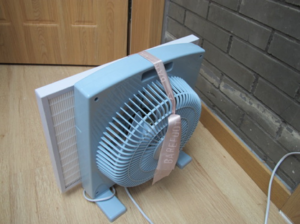 Use string to strap the HEPA filter onto the front of the fan, and you’re done! Your very own DIY homemade air purifier. The metal bar in the middle will stick through the filter a little bit. You could saw the metal bar off, but my tests show it doesn’t seem to make a difference. 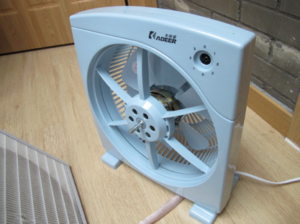 Or better yet, make yourself a fancier DIY air purifier by finding a fan without a metal bar in the front, like the DIY air purifier I ship through Smart Air. 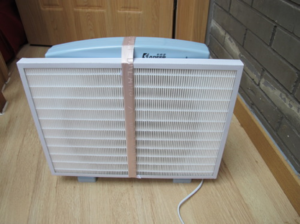 Total cost for this DIY air filter: 166 RMB (US$27). Compare that to 8,000 RMB ($1,300) for the fancy purifiers here in Beijing. 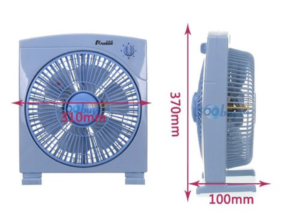 I now ship a simple fan and a filter with a simple upgrade that increases clean air output by 15% over my original design for 228RMB (US$37). 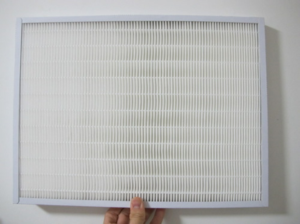 Your next question is probably, does this DIY air filter work? See a live test here, how well it works if we use a stronger fan the DIY Cannon, comparison tests with the big brands, and a 200-day HEPA longevity test. P.S. Should the filter go on the back?? You might be wondering, “shouldn’t the HEPA go on the back of the fan?” I always thought the answer would be “it works just as well both ways,” but I put it to the test, and the results surprised me. Click here to read more on the counter-intuitive results on filter placement! Are DIY purifiers still cheap in the long run? Should air purifiers have the filter on the front or back? Hi there. I have done a similar thing ihere in Chaing Mai but instead of using a Hepa filter I used Filtrete air con paper made by the company 3m. Do you think this would also be an effective way of cleaning the air? Yes, you can use the 3M AC filters for your air conditioning! We have actually tested this, but are yet to write up a report on it. What we found was that using the paper on air conditioners was effective at removing around 80% of PM2.5 in a small 10sqm room. However the effectiveness will depend greatly on how powerful your AC is and how often you change the filter paper. Are the HEPA filters washable? Or do you have to replace the filter after 6 months or so? Good question Glenn! We wanted to know the answer to that, so we ran tests and published the results. Read about whether or not you can wash HEPA filters here. WOW That is awesome marvellous and outstanding. I do prefer this site for many diys! exhaust fan with the air flow rate at 830m3/hour, using both HEPA filter and activated carbon filter for purifying my newly renovated house? Do you have your filters and such available for purchase in North America? I’ve enjoyed navigating around your website! Thank you for all the work and publishing the information. We’re always looking for distributors to spread our low-cost solutions and the knowledge that clean air doesn’t need to cost an arm and a leg, and North America is definitely within our sites if you know anybody who might want to help out! Terrific! Many thanks for sharing your work.